Gears of Halo - Video game reviews, news and cosplay : Look who's turning up as major characters in Halo 5! Look who's turning up as major characters in Halo 5! Halo fans may spot that the Masterchief has some new mates to play with in Halo 5. This time round Cortana is gone (remember in H4 she gave her digital life so the Chief would make it) and he has some well known characters from the expanded universe at this side. Welcome to the videodrome, Kelly, Fred and Linda! 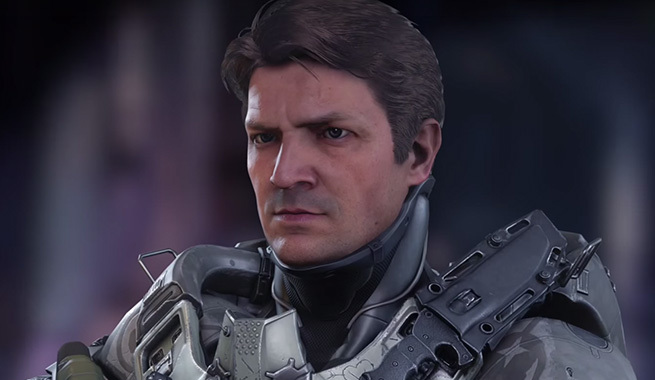 That's the face of Nathan Fillion as Buck from ODST! Your mom might refer to his as that guy from Castle too! We say this is a nice mix up for Halo 5 - We love the concept that Jameson Locke's Fireteam Osiris will be hunting down Team Blue.